Last week, Societe Generale SA announced it was shutting down its commodities derivatives business, while powerhouse Goldman Sachs Group Inc. cut about 10 jobs commodities last month. Goldman said on Monday it had identified “opportunities to cut expenses” in the commodities division, some of the first public comments from the bank on how it’s reshaping a business that was once the envy of Wall Street. Marex has also benefited from investing in technology at a time when increased volatility is attracting new quantitative investors into the market, Lowitt said. With only a handful of specialist metals hedge funds left in the sector, algorithmic trading firms have become increasingly dominant, helping to drive a rebound in trading volumes on the LME last year. 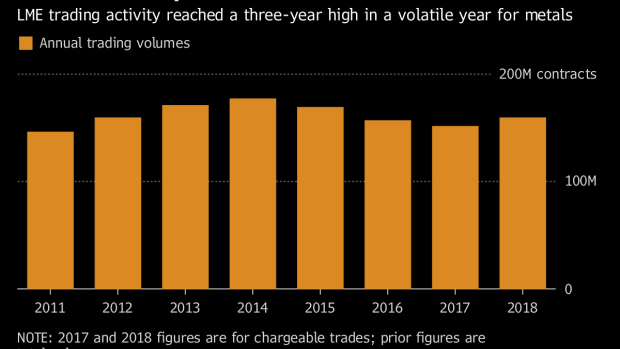 Brokers’ profits rose during some sharp swings in metal markets over 2018, with the imposition of sanctions on United Co. Rusal wreaking havoc in the aluminum industry, while U.S. President Donald Trump’s trade war against China upended the outlook for copper. Zinc dropped by more than a quarter as a wave of supply threatened to swamp the market. Still, it wasn’t all plain sailing. Marex’s profit was impacted by a $31.9 million provision for potential losses arising from a 2016 fraud involving forged nickel storage receipts. Excluding that, pretax earnings rose 80 percent to $45.2 million.